Just past midnight on August 19, as the rest of the Yale football team slept before the first day of fall camp, Andrew Grinde made his getaway. The five-foot-eleven freshman running back slipped out of his room in Lanman-Wright Hall, taking care not to rouse his roommates, and walked out to High Street, where an Uber awaited him at the curb. He rode to Union Station, then boarded a night train to Philadelphia. By the time Grinde’s teammates woke up, he was long gone. He’d left behind a gift—a big yellow and grey suitcase filled with most of his clothes, which the other freshman recruits proceeded to rifle through—and a lot of questions. Grinde grew up playing sports with his older brother Jimmy and working on his family’s farm in Great Falls, Montana, a tight-knit community of 60,000 nestled between mountains and farmland. Though his parents divorced when he was young, they “supported him through everything,” he wrote in an email from Bozeman, Montana last month. Throughout high school he went for bike rides and lifted weights with his mother Cyndy, a personal trainer, and ate dinner with her five nights a week. To Grinde, Montana is the greatest place in the world. “You feel a sense of freedom,” he wrote. “People in Montana are able to live their lives doing what they want to do.” In Great Falls and the surrounding suburbs, football is king, and Grinde was at the epicenter of it all. He started playing flag football in third grade, tackle in fifth. This will be the first season he’s sat out. By the time Grinde’s teammates woke up, he was long gone. He’d left behind a gift—a big yellow and grey suitcase filled with most of his clothes,which the other freshman recruits proceeded to rifle through—and a lot of questions. The eleven-minute high school highlight reel, which has been viewed over two thousand times online, is utterly silent. No 2 Chainz, no trap beats, not even a roar from the crowd. There’s nothing to distract from the football. At 210 pounds, Grinde has the stocky build of a power running back. But he’s got speed, too; the video opens with Grinde catching a screen in the backfield and sprinting seventy yards down the left sideline with the entire defense in hot pursuit. In the next clip, he jukes a hapless defender to the ground. He blocks a massive lineman onto his back, makes a leaping sideline catch, and spins out of a defender’s arms in a split second. The Gatorade press release mentions academic credentials in step with Grinde’s athletic prowess: 4.0 GPA, vice president of his class, elementary school tutor, Special Olympics and United Way volunteer, youth soccer coach. He played basketball on the side—and led the state in three-point shooting percentage. Paul Rice, Yale’s Montana recruitment coordinator, tracked Grinde down after that junior season. “He had Ivy League aspirations and grades,” Lett said. He was the kind of recruit coaches covet. Harvard and Columbia were after him, too, but ultimately Grinde chose Yale. He liked Yale’s coaching staff, he had gotten along well with his teammates during his recruitment visit, and he was excited to live in New Haven. Grinde’s success brought him statewide renown. “He’s a small-town hero,” wrote Patrick Brennan, a high school friend of Grinde’s. “Everyone wanted to be associated with him.” That reputation awaited Grinde at Yale: Division I football, a potential starring role, the chance to play in front of tens of thousands of fans at The Game. In Great Falls and the surrounding suburbs, football is king, and Grinde was at the epicenter of it all. After a season of awards and broken records, Grinde’s future was secure. He committed to Yale on August 6, 2015, before his senior year at C.M. Russell. But his love for football started to erode. As the season began, he had doubts about whether he wanted to play for four more years. Football was making him feel sick of school, and impeding his “will to be a happy and innovative student,” he wrote. Then, in a mid-October game against Billings Senior, he fell on his left shoulder and his AC joint separated, sidelining him for several games. Football is a dangerous game, and Grinde knows it. “My brother studies neuroscience in college and has been warning me about head trauma for a while now,” he wrote. “Any life changing injuries like that worry me quite a bit, especially since I was blessed with a mind that got me into Yale.” Still, Grinde insisted, he never would have stopped playing for fear of injury. But in the midst of a season in which he was already reconsidering his commitment to the sport, this was another setback. As his senior spring turned to summer, Grinde felt increasingly set on taking a year off. He knew he could rejoin Yale’s team after a year away, though a longer deferral would be harder for the coaches to accept. But he balked at the last moment and decided to give the team a shot. Back home, he was lifting for ten hours a week; he showed up to camp at 225 pounds and felt stronger than he ever had before. Incoming freshmen football players leave their schools fairly often, Lett said; they get homesick, or lose their sense of commitment to the sport. But this rarely happens at Yale. At first, the team heard nothing. Then, a text. The only reason he was playing football, Grinde explained, was because his dad wanted him to. He didn’t love the game anymore. A couple of days after his departure, there was another update, this time from Chicago. 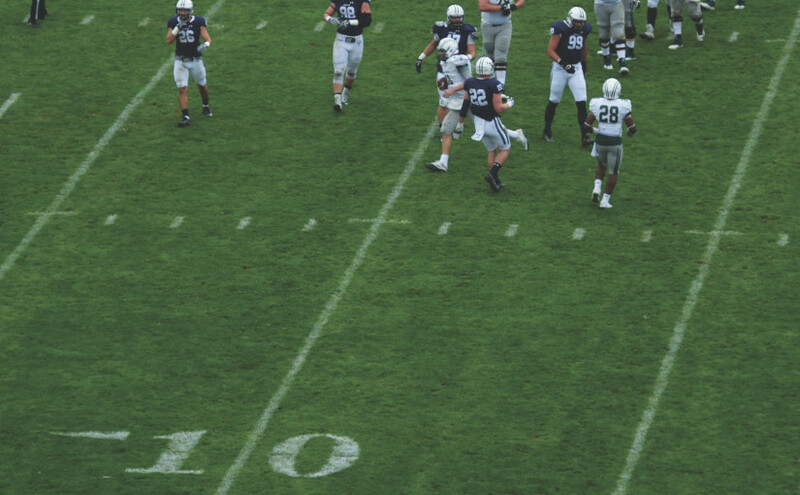 Two weeks later, that was the last the other Yale football players heard from him. The team was blindsided. Incoming freshmen football players leave their schools fairly often, Lett said; they get homesick, or lose their sense of commitment to the sport. But this rarely happens at Yale. In fact, as far as Lett knows, this is the first time it’s happened in Tony Reno’s five seasons as Head Coach. Grinde knew he was ultimately headed back home to Montana, but he had no plan, no timetable. From Philadelphia, he took a train to Harrisburg. Then a bus to Pittsburgh. A midnight train to Chicago. He explored each city by day and slept on trains and buses by night. He was free, careening across the country on his own—but not for long. Steve Schreck of the Great Falls Tribune reported Grinde’s departure from Yale on August 24, writing that Grinde, “one of the most heralded recruits in recent Rustler history, will not be a part of the Yale football program this season.” John Amsden, a personal injury attorney from Bozeman, Montana, saw the news. He reached out to Grinde and offered to help him find work in Bozeman. In the midst of his travels, Grinde accepted a position as a legal assistant at Amsden’s law firm, Beck, Amsden & Stalpes, PLLC. Though Grinde had planned to travel for a few more weeks, he put his wanderlust aside and took a twenty-eight-hour train ride from Chicago, through Minneapolis, and back to Montana. Now, Grinde is keeping himself busy, working at the firm forty hours a week. He has been doing research for testimonies, gathering information for cases, and assisting Great Falls District Judge Dirk Sandefur in his campaign for a seat on Montana’s Supreme Court. In his free time, Grinde takes online courses on real estate. And he still works out for a couple of hours every day. Throughout his childhood, Grinde longed to play in the NFL. But gradually, that ambition faded. Back in Montana, he is pursuing a new dream: a year away from football. But even now, the game follows him. He owes his internship in part to his stardom—after his career at C.M. Russell, the entire state had his back. Now, he talks of other dreams, of traveling from city to city on his own. “I decided to quit living my life for other people,” he wrote. He wants to make enough money to travel the world. Where does he want to go? He tells me it’s “quite a long list.” One day, he hopes to buy a lake house. He mentions this out of the blue. Why a lake house? “There’s nothing but good vibes while staying at a lake house,” he wrote. “And I am all about good vibes.” As Grinde dreams of his future, football doesn’t appear to cross his mind. As Yale’s football season unfolds, 107 of his former teammates will be lifting, practicing, and playing together in New Haven. At Beck, Amsden & Stalpes, over two thousand miles away, Grinde will be sitting at a desk, living for himself. a great story…and I appreciate his lust for life but Yale football is something special as is Yale….take time off..a couple of years if you have to, but don’t give up the Yale experience. It may be something you regret down the line. all the best !